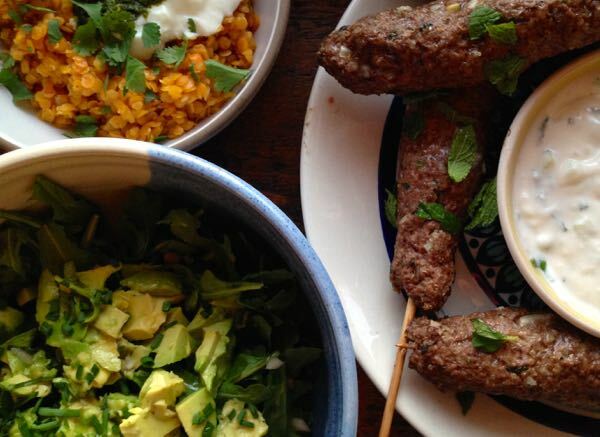 We were particularly far from sadness on the Sunday night we had this meal: Lamb kibbeh with mint-cucumber yogurt sauce (page 81, Dinner: A Love Story), basic arugula, avocado salad with a shower of chives (with this dressing) and a quick pot of curried red lentils. In a medium pot set over medium heat, cook shallots or onions in olive oil until softened, about 3 minutes. Add curry, garlic powder, smoked paprika, salt and pepper, and cook another minute. Add curry paste, smushing into the onions, and cook another 30 seconds. Add lentils, stirring around until shiny, then add chicken broth, just enough to cover the lentils. Bring to a boil, then back down to a simmer. Simmer about 12 minutes, stirring every few minutes and making sure lentils don’t completely break down. Start tasting after eight minutes — when lentils are firm but not crunchy, turn off heat. If there is a lot of liquid left, drain into a colander. Otherwise, use a slotted spoon to serve. Leftovers make a great breakfast, especially with a fried egg on top. This would be so perfect with a fried egg! And you’re right- no one can be sad when good food is around. The happiest meal I remember is after my last baby was born, and all the relatives had gone, and it was just us and a homemade spaghetti sauce I had made and put in the freezer for a quick meal. It tasted heavenly, and we were all so happy to be alone again. But what about the casseroles from friends and family after a death in the family? I have never felt so nourished and satisfied by food as by those dishes filled with love and concern. 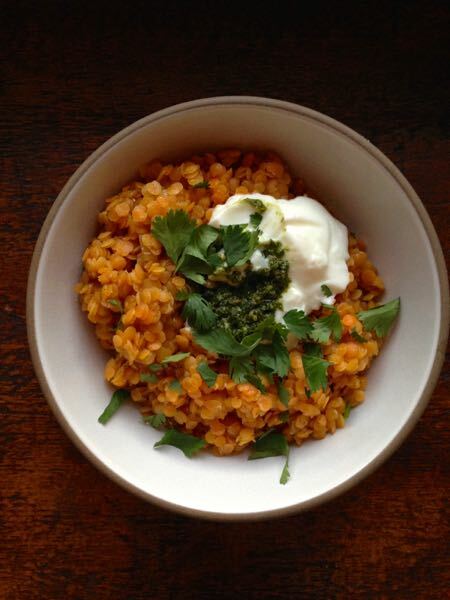 I’m so in love with lentils but have only cooked with them in a soup….time to change that! Where I come from, sadness often brings out some of the best food. Funeral food is in its own category! That was my first thought/reaction to your post title. Such a great quote! and that dinner is what we need to add into our sometimes stale rotation…Thanks! I love coming to your site. It cheers me in ways that are generally reserved for quiet encounters with nature, or nonstop laughing sessions with my family. Thanks again. Lastly, I’ve read so many wonderful books per your recommendation on this website (and on Nerd Alert), so thank you-thank you! SWADS! Love that stuff! This looks nice and simple- think it might just be what was needed tonight! I made the red lentils to accompany grilled steak and your sandwich slaw (from the Playbook) and my 7 year old declared, “I could eat these all day long!” Winning!! But now that I have a jar of red curry paste, what else can I make? ?